Said to come from the drink, The Straits Sling, the Singapore Sling has a long history of struggling authenticity, whether the first practiced recipe was lost and experimented back to life from a loyal customer, or many names throughout time coming out with their claim to knowledge. For me at least, it’s not so much what ingredients, but how much of what ingredients. Regardless if the original Singapore Sling came from the Raffle Hotel or not, the amounts of the ingredients have altered through time. I’ll first show you The Raffle recipe, then the one I like best. I’ve tasted others too, even liked some, and am not saying there is only one recipe to drink, even suggesting you try all the different recipes you find to see for yourself. Garnish with a slice of pineapple and cherry. Okay, a quick history for reference: Before there was the cocktail, which is a generic term in modern times, what began it all was the punch. The earliest British documented reference to punch dates to 1632 from India by sailors and employees of the British East India Company. The word comes from the Hindustani “panch,” meaning “five flavorings,” that is – spirits plus lemon, sugar, water or tea, and spice. Most punches at that time were mixed from wine or brandy. Later, when the Barbadian and Jamaican rum trade began to thrive, rum took the place of brandy in many recipes. In 1655, British punches began using rum. 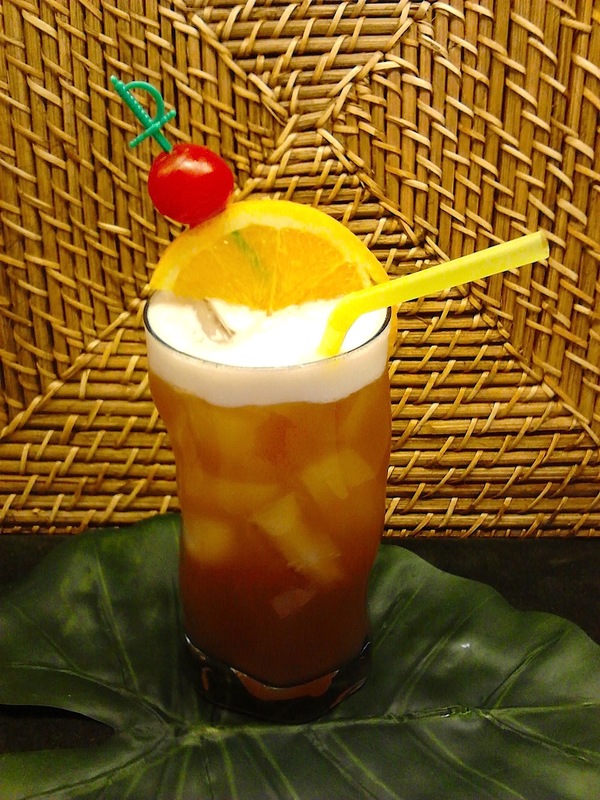 There are several rum-based punches, the two most historical rum punches are the Planter’s Punch and Bajan Rum Punch. Bajan (Barbadian) Rum Punch is one of the oldest rum punches and a simple recipe commemorated in a national rhyme, “One of Sour, Two of Sweet, Three of Strong, Four of Weak.” That is: one part lime juice, two parts sweetener, three parts rum (preferably Barbados), and four parts water. The sling showed signs around 1759, which is a spirit, sugar and water, and mainly at first garnished with citrus peel and nutmeg. Close to 1800, the sling found itself with the addition of bitters, making it a cocktail. The earliest definition of the cocktail in print called the beverage a “bittered sling,” a mixture of spirits, sugar, water, and bitters. The definition of a sling is an iced alcoholic drink, typically containing gin, water, sugar, and lemon or lime juice. I enjoy Haigh’s drink recipe better because of how he changed it, in effect highlighting the flavors where they were not as perceptible. Believe it or not, the flavor of the gin is not as pronounced thanks to the other adjustments. Lessening the pineapple juice makes it less of a dominant flavor, and more like a spice, as well as upping the lime juice and Cherry Heering please my taste buds more desirably. Understandably, adding soda water thins the drink, but thankfully so since the earlier recipes did not succeed with me. Maybe Dr. Cocktail simply made it more refreshing as well. Shake all but soda with ice. Strain into ice-filled, pre-chilled, collins glass. Top with soda water and stir. Garnish with cherry, orange wheel, and pineapple (sorry – no pineapple on hand for the image).